Taken at Cairo’s Gezira Club by the late Zeinab Lamloum, a great photographer, devoted ashtanga student and good friend. There are some places that simply draw us, that holds a place in our hearts and our imaginations, that stirs in us some deep kind of recollection of what it is to be terribly, beautifully human. Since late 2013, that place for me has been Egypt. So, in this year which I’ve dedicated to living more fully, more authentically, making my fourth teaching trip to Cairo feels like a pretty good idea. Over the last few years, I realize, I have formed an interesting, and ever changing, relationship with the place and its people. My first trip, I subbed for fellow teacher, Egyptian Iman Elsherbiny when she took her own trip to study with our teacher in Mysore, India. That first experience was like stepping into someone else’s life, living in her apartment, teaching her classes, being taken around by her friends. My second trip, I joined forces with Iman to help her open her new yoga space, The Shala in Maadi, during which we did a few retreats together which solidified our own sisterhood; her friends became our friends. The last time, I was teaching workshops and retreats, mostly on my own, I spent practically every weekend away from Cairo, it was beautiful but discombobulating. I started to make my own connections, but it was snippets of a life in a whirlwind. In a way, over those trips, Egypt and I were having a romance, intense but fleeting, substantial enough that it has kept me wanting more; so risky at times that I wanted to keep myself at a safe distance. Still, the feeling remains, I know that Egypt and I like each other. It’s been nearly a year and a half since my last meeting with Egypt and I wonder whether we’ll jive or not, whether we can we still top the magic of the first, second, even the third time?! I’m not going to try to think too much or speculate the possibilities. I can’t speak for Egypt, but I know I’ve changed and I have a feeling that in the backdrop of Cairo I will know how much more different I am from the other times I’ve come to visit. I know I have grown there, and I know there is probably more growing to do together. I have different intentions than previous trips. Instead of seeking adventure, wanting to teach everywhere and spreading myself too thinly, I am concentrating my energy, hoping for a stable two and a half months of teaching and self-study. This time, I am making Nūn Center in Zamalek my base for two months, while continuing to offer Inner Dance in The Shala in Maadi, where the healing modality grew a steady following by the end of 2014. Between April 17 and June 10, I will be teaching a Sunday to Thursday Mysore program between 7:30-10am at Nūn Center (pronounced “noon,” Nūn is the symbol for primordial water in Ancient Egypt), along with supplementary weekend workshop classes on Friday mornings that will include “Introduction to Ashtanga Yoga” and various themed explorations paired with the traditionally counted led class. For more information on the Nūn Ashtanga and Inner Dance offerings, please check out the website http://nuncenter.com. Email or call for bookings and inquiries we@nuncenter.com/+20 122 398 0898. I will also be facilitating Inner Dance in The Shala in Maadi on Thursday evenings. For information on the Inner Dance schedule please call 01223717729-01222384498 or check out The Shala Facebook Page. There will surely be more in store, dates are being floated and ideas are brewing. So, please continue to check in for updates. I can’t say where this romance will take me, but I suspect it’s where I want to be going, deep into the personal work that fuels my own teaching, my hunger for learning, and my love for living. I’m excited to say: Cairo, I’m coming. 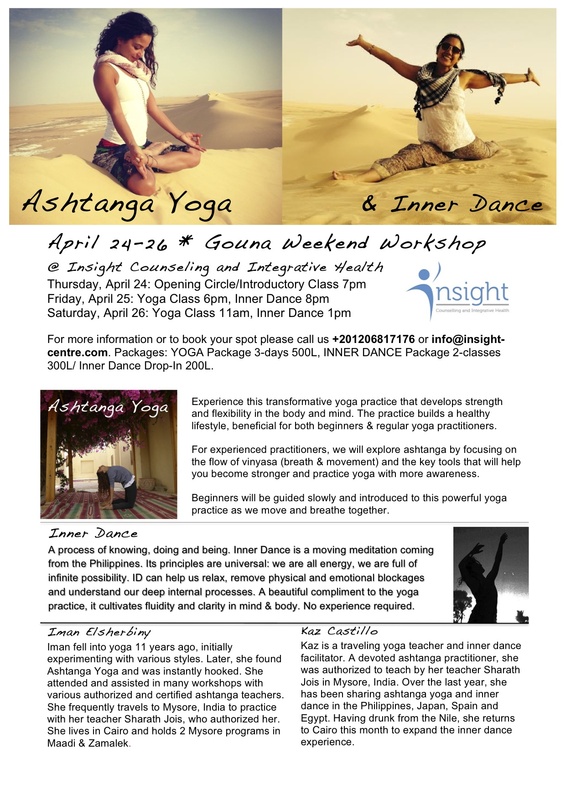 Join Amy and I for the Gouna Weekend Workshop on April 24-26. Beautiful Gouna is located on the Red Sea in Egypt. When you really give yourself space, when you give yourself room to breathe, something magical inevitably happens, something moves and flows. Photo: Shifo enjoying a solitary boogie during our Ashtanga Retreat in the White Desert a couple of weekends ago. Iman Elsherbiny and I are in Cairo this weekend, teaching Ashtanga and Inner Dance workshops near City View. To join or for more information please contact Mariam Sobhy on 01001188660. Happy to be offering more inner dance as a compliment to the yoga practice this weekend. Come and explore the ashtanga yoga practice with Iman Elsherbiny, then open to the flow of your own intuitive wisdom with Inner Dance, a moving meditation and healing modality from the Philippines. For full details, see poster. In two days: a new journey. Farfara Oasis with it’s famed White Desert is known for the expanse of chalk white and curious rock formations sculpted artfully over time by the rough desert winds. Once a sea-bed, and then a savannah of lush green with herds of roaming gazelles, giraffes and elephants, it is now a living monument of ever changing time–a fitting place to practice yoga. Free of distractions, the wide open areas of the desert, is a symbol of the clarity and purity that can be achieved by regular yoga practice. Slowly day by day, we are clearing away the debris of stress and tension, attachment and expectations, of our own preconceived ideas and cultural conditioning. Going into the desert can also be tough, a harsh landscape, full of trials, bringing out the most innate of survival instincts. This is also true about the yoga practice. It can be full of struggle, pushing one to his/her limits, initiating one into the process of birthing and dying, of receiving and releasing, finding that oh-so-difficult balance between holding one’s center and simply letting go. And so we plan…There’s no harshness built into the program as we have excellent guides, only one day of camping, a very modern, very comfortable trek into the desert, but the foray into the Great White is built into the yoga practice, into the asana-s, into the meditation, inner dancing and the satsang, each in its own way an opportunity to observe who we are in this liberating landscape. PHOTO: Care of Freedom Travelers, who are expertly organizing this trip. Ashtanga in the Desert: A Yoga Retreat is on Thursday March 27-30. Co-teaching with me is the lovely Iman Elsherbiny. After some time, after regular practice, something strange, different may happen…Before you know it your practice has gone beyond the four corners of your rubber mat. I arrive Thursday evening. Al Cairo, the crazy city that somehow has drawn me back. I found myself a little anxious as I boarded the plane. Was this an act of insanity, was I really returning to this crazy city? I worried about life on the road there, the gridlock, the hot tempers and near misses that characterizes life in Cairo. My friend and fellow teacher, Iman Elsherbiny, has arranged for someone to pick me up. Ashraf is on a yoga study-exchange and only started with visiting teacher Sonja Radvila in February. He’s been going regularly ever since, and he tells me right away how much he loves it. Not ten minutes out of the airport, a car full of people nearly back into us–we are on a highway. It’s a near miss, but horns are honked, and windows are rolled down and I am expecting the exchange of harsh words. Ashraf surprises me. He smiles, speaks jovially across to the other driver. For a split moment there is a sense of dismay; this is not supposed to happen. And then the whole thing shifts. Tension melts away as the other driver laughs as well, goodwill traveling between two cars in the middle of a bustling highway. Then we go our separate ways. Something in me relaxes. All is well. I commend Ashraf in his good humor, his ability to change what could have been an ugly situation. And he laughs and credits the ashtanga yoga practice. He says that he can feel the change. I love this. I love how the process works, how the care, calm, consciousness cultivated in yoga practice inevitably spreads into daily life. LIVING IN CAIRO & INTERESTED IN YOGA: Iman Elsherbiny (0122371729) and I (0101348097) are offering privates in Maadi. Iman’s regular class schedules can be found in Ashtanga Yoga Egypt’s FB page. We are taking a group into the White Dessert this weekend, March 27-30 for a special yoga retreat, if you’re interested, call or email me kaz.castillo@gmail.com. More details on FB, look for Ashtanga in the Desert. PHOTO: On the road with Ashraf and Iman, sunset along the Corniche in Cairo. PHOTO: White Desert, Egypt. Save the date announcement was posted today on Facebook. Very excited to be planning my trip and class offerings,not to mention the chance to reconnect with students, friends, and adopted family. More details to follow soon!